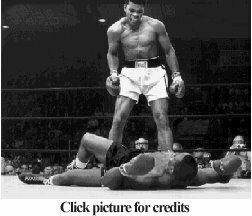 Muhammed Ali has sold 80% of his name to a marketing company to use as they please for $50 million US. Now he can live on forever in ads for Pepsi, McDonalds and DARE (to keep your kids off drugs). The likenesses and names of James Dean, Marilyn Monroe and Elvis Presley have already been bought by private marketing companies....and they still appear in ads.